The hotel was very clean and comfortable. It was quite as well. I would recommend this hotel for business trips or affordable family outings. My only compliant out of a two night stay was on the last day the housekeeper came in the room twice trying to clean the room when we still had another two hours before check out time. Other then that very nice. The hotel was in a remote location but not to close to anything else. It was very quiet even though it is right off the beltway. On the last day of our stay the housekeeper came in the room twice trying to clean it, but we didnt have to be checked out for another two hours. The 50-room Best Western Sam Houston Inn and Suites is close to horse racing at the Sam Houston Race Park and provides affordable quality accommodation for both the vacationer and the business traveler. Items included with the room rate at this two-story inn are a continental breakfast, high-speed Internet access, in-room tea and coffee and parking. There is one meeting room available for business or social functions. The property is 19 miles from downtown Houston. Landmarks and attractions closer to the property include the Methodist Willowbrook Hospital, the University of Phoenix, the George Bush Intercontinental Airport and shopping at the Northwest Mall, the Galleria Mall and the Willowbrook Mall which is less than two miles from the property. All the rooms have a work desk with high-speed Internet access, 27-inch television with cable news and movie channels, easy chair, an AM/FM radio-alarm clock, tea and coffee making facilities, refrigerator, microwave oven, iron and ironing board, hairdryer and a telephone with speakerphone. There are 40 non-smoking rooms and two handicap accessible rooms. This hotel has an outdoor swimming pool and an exercise facility. The 24-hour front desk has information on area events and attractions. Other amenities include copy and fax services, a guest laundry, daily housekeeping and ice and vending machines. The complimentary breakfast is the only meal served here. The property is adjacent to the Steamboat Steakhouse and a Jack in the Box. Other restaurants nearby include the Hickory Hollow Barbecue, a Sonic Drive-In, Kirins Japanese Restaurant and a Pappadeaux Seafood Restaurant. 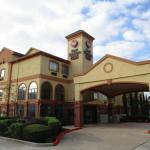 This Best Western gets the thumbs up from visitors to Houston who stayed at this hotel. They said they were impressed with the large chandelier in the lobby and the quality décor which extended into the spacious and well-equipped rooms. There were good comments too about the cheerful crew of employees and many said the complimentary breakfast was better than they had expected. Most clients said they could easily stay here again and had no problem recommending the property to fellow travelers.